Neck pain is quite common, and one may not be able to pinpoint the exact reason for waking stiff or sore. Maybe it was something done the day before to aggravate it, or it may have been sleeping position. 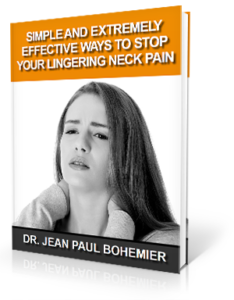 There are some ordinary reasons that neck pain occurs and simple ways to avoid the pain. Let’s take a closer look at these. Straining the neck by repetitive movements or overstretching the neck muscles can lead to neck pain. What are some common causes for this to occur? Overuse: Activities such as painting a ceiling or playing tennis can be a strain on the muscles of the neck, leading to pain. Stress: When one is stressed, the muscles in the neck, head, and shoulders are automatically tensed. This can also happen when a person hyper-focused on one thing for a long time. Wrong sleeping position: Using the wrong pillow is almost always to blame for this one. A pillow that is too flat or too high can equally stress the neck. Sleeping on the stomach with the head turned to one side is another serious offense when it comes to neck problems. Holding the head in an uncomfortable position: This can include holding the phone between the shoulder and the ear, keeping the head turned while watching TV, or bending the head forward to read or look at a mobile device for too long. To learn more about the connection between head and neck injuries and chronic neck pain download our complimentary e-book by clicking the image below. Other than avoiding the above activities, are there any other ways to cope with neck pain? Visiting us here at Solara Health in is a great place to start. Upper cervical chiropractors focus on the bones of the neck to make sure they remain in proper alignment. If the C1 or C2 vertebra misaligns by just ¼ of a millimeter, the entire body can be affected. This is a major reason for neck pain and if a misalignment exists, avoiding the everyday strains noted above will not correct it alone. A misalignment needs to be handled by a professional. We use a gentle and precise method and see great success in helping our patients cope with neck pain. To schedule a complimentary phone consultation with the Dr. Bohemier and Solara Health call (403) 266-2283 or just click the button below. Migraines and Headaches: Is There a Difference?